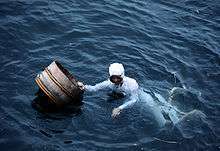 It is possible to fish and gather many sea foods with minimal equipment by using the hands. Gathering seafood by hand can be as easy as picking shellfish or kelp up off the beach, or doing some digging for clams or crabs. The earliest evidence for shellfish gathering dates back to a 300,000-year-old site in France called Terra Amata. This is a hominid site as modern Homo sapiens did not appear until around 50,000 years ago. Noodling: is practiced in the United States. The noodler places his hand inside a catfish hole. If all goes as planned, the catfish swims forward and latches onto the noodler's hand, and can then be dragged out of the hole, albeit with risk of injury to the noodler. 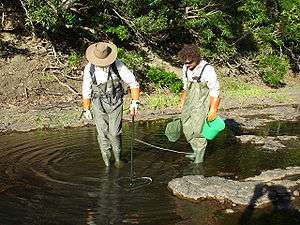 Trout binning - is another method of taking trout. Rocks in a rocky stream are struck with a sledgehammer. The force of the blow stuns the fish. 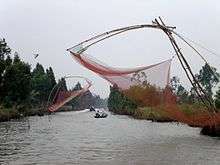 Kite fishing is said to have been invented in China. It was, and still is, used by the people of New Guinea and other Pacific Islands - either by cultural diffusion from China or independent invention. Kites can provide the boatless fishermen access to waters that would otherwise be available only to boats. Similarly, for boat owners, kites provide a way to fish in areas where it is not safe to navigate such as shallows or coral reefs where fish may be plentiful. Kites can also be used for trolling a lure through the water. Suitable kites may be of very simple construction. Those of Tobi Island are a large leaf stiffened by the ribs of the fronds of the coconut palm. 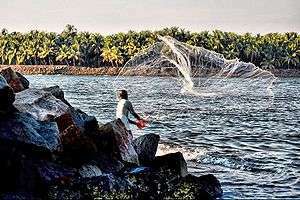 The fishing line may be made from coconut fibre and the lure made from spiders webs. Modern kitefishing is popular in New Zealand, where large delta kites of synthetic materials are used to fish from beaches, taking a line and hooks far out past the breakers. Kite fishing is also emerging in Melbourne where sled kites are becoming popular, both off beaches and off boats and in freshwater areas. The disabled community are increasingly using the kites for fishing as they allow mobility impaired people to cast the bait further out than they would otherwise be able to. Ancient remains of spears, hooks and fishnet have been found in ruins of the Stone Age. The people of the early civilization drew pictures of nets and fishing lines in their arts (Parker 2002). Early hooks were made from the upper bills of eagles and from bones, shells, horns and plant thorns. Spears were tipped with the same materials, or sometimes with flints. 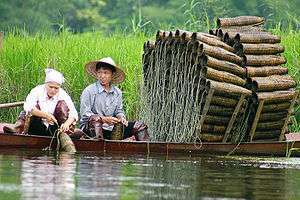 Lines and nets were made from leaves, plant stalk and cocoon silk. 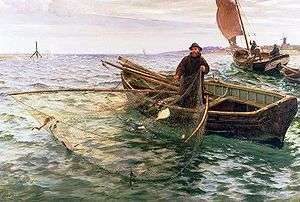 Ancient fishing nets were rough in design and material but they were amazingly, as if some now use (Parker 2002). Literature on the indigenous fishing practices is very scanty. Baines (1992) documented traditional fisheries in the Solomon Islands. Use of the herbal fish poisons in catching fishes from fresh water and sea documented from New Caledonia (Dahl 1985). John (1998) documented fishing techniques and overall life style of the Mukkuvar fishing Community of Kanyakumari district of Tamil Nadu, India. Tribal people using various plants for medicinal and various purposes (Rai et al. 2000; Singh et al. 1997; Lin 2005) extends the use notion for herbal fish stupefying plants. Use of the fish poisons is very old practice in the history of human kind. In 1212, King Frederick II prohibited the use of certain plant piscicides, and by the 15th century similar laws had been decreed in other European countries as well (Wilhelm 1974). 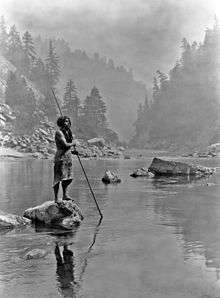 All over the globe, indigenous people use various fish poisons to kill the fishes, documented in America (Jeremy 2002) and among Tarahumara Indian (Gajdusek 1954). ↑ Keegan, William F (1986) The Optimal Foraging Analysis of Horticultural Production American Anthropologist, New Series, Vol. 88, No. 1., pp. 92-107. ↑ Szabo, Katherine Prehistoric Shellfish gathering. ↑ Catelle, W. R. (1457). 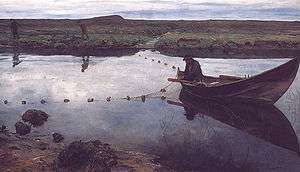 "Methods of Fishing". The Pearl: Its Story, Its Charm, and Its Value. Philadelphia & London: J. B. Lippincott Company. p. 171. ↑ Trout binning in The Mirror of Literature, Amusement, and Instruction, Vol. 12, Issue 328, August 23, 1828, Project Gutenberg. ↑ "Trout Tickling: Catching a Fish with Bare Hands". Retrieved 28 September 2014. ↑ Image of an eel spear. 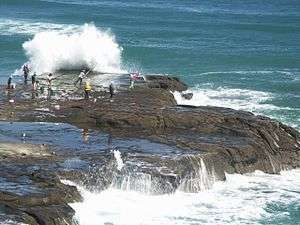 ↑ Spear fishing for eels. ↑ Dunbar, Jeffery A (2001) Casting net NC Coastal fishing. Retrieved 25 August 2008. ↑ j.WALKER Network (2013). 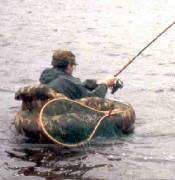 "pitch fishing". 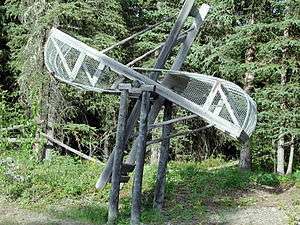 www.theoutdooractivity.com. Retrieved 2014-04-21. ↑ KiteLines Fall 1977 (Vol. 1 No. 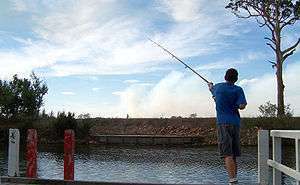 3) Articles on Kite Fishing. ↑ Shooting and Fishing the Trent, ancient fish traps. ↑ The Text of Magna Carta, see paragraph 33. ↑ M.B. Santos, R. Fernández, A. López, J.A. Martínez and G.J. Pierce (2007), Variability in the diet of bottlenose dolphin, Tursiops truncatus, in Galician waters, north-western Spain, 1990 – 2005 (.pdf), article retrieved April 3, 2007. ↑ Dr. Moti Nissani. "The Dolphins of Laguna". ↑ The Telegraph (2006), Brazil's sexiest secret, article retrieved March 11, 2007. ↑ Dr. Moti Nissani (2007) Bottlenose Dolphins in Laguna Requesting a Throw Net (video). Supporting material for Dr. Nissani's presentation at the 2007 International Ethological Conference. Video retrieved February 13, 2008. ↑ Simões-Lopes, Paulo C.; Fabián, Marta E.; Menegheti, João O. (1998). "Dolphin interactions with the mullet artisanal fishing on southern Brazil: a qualitative and quantitative approach". Revista Brasileira de Zoologia. 15:709-726. 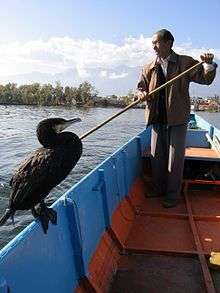 ↑ Cormorant fishing: history and technique. ↑ De Orbe Novo, Volume 1, The Eight Decades of Peter Martyr D'Anghera, Project Gutenberg. ↑ Explosions In The Cretan Sea: The scourge of illegal fishing -- fishing with explosives. ↑ "Beam trawling on the North Sea". Greenpeace. Retrieved 2009-01-12.